A "Caboodle" or makeup case keeps everything together and well organized. See our list of stage makeup including eye makeup, face makeup, lipstick and lipliner. Put your own personal kit together and be ready for "quick changes"
This caboodle has great ratings and is sturdier than many on the market - worth a look. 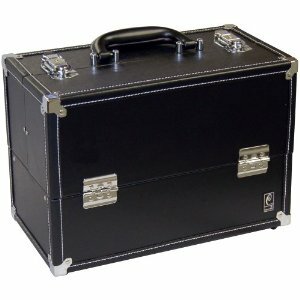 The sturdier latches make for a nice but a little more expensive makeup case for dance comps. This Shany model comes in many different colors - you can see them all here. There are also more styles of dance Caboodles availble so pick the one that is right for you. This checklist shows some of the most popular MAC makeup for competitive dancers and stage performers. Here is a checklist of MAC makeup you may need for dance and stage. Keep everything organized in a Caboodle. You can even use a fish tackle box or anything else with compartments to keep everything organized. This new zebra makeup case is the style that Sloane likes. Zebra patterns are quite popular. Plenty of room for makeup and easy to open, easy to use.